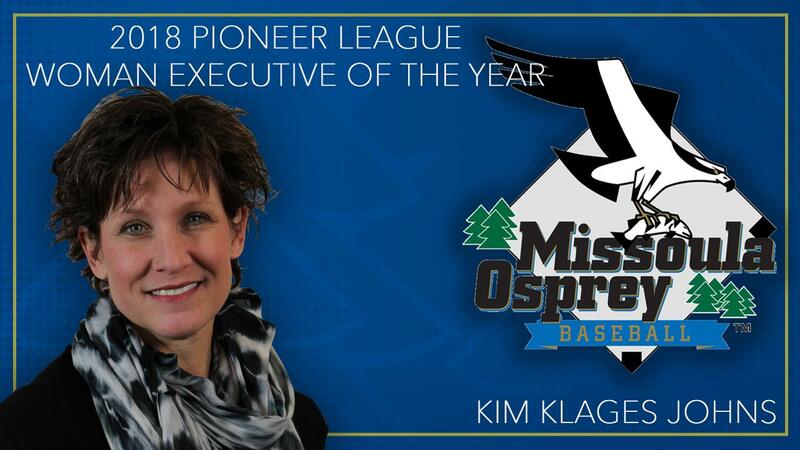 Last week, the Pioneer League announced its end of season awards for 2018 - league president Jim McCurdy has tabbed Kim Klages Johns of the Missoula Osprey as the Pioneer Leagues Nominee for the Rawlings Woman Executive of the Year. Klages Johns, the Osprey' Director of Community Engagement & Retail, continued to establish herself as a key cog in the Osprey Front Office staff. In 2018, Klages Johns developed and implemented an employee incentive and retention plan for the Osprey Day of Game staff, created a new concession stand featuring the locally based Hunter Bay Coffee and "kid friendly" treats like Italian sodas. With a touted history of success and expertise in retail, Klages Johns developed a merchandise plan centered around the 2018 Missoula Timberjacks promotion and the reimplementation of the "fish and talons" logo, ultimately producing one of the most successful retail campaigns in team history. Annually the Pioneer League releases its list of awards and nominees which includes honors such as PBL Executive of the Year, Nominee for the Rawlings Woman Executive of the Year, Nominee for the John H. Johnson Presidents Award and more. 2018 marks the second occasion the Osprey have had a nominee for the Rawlings Woman Executive of the Year - in 1999 Judy Ellis received the Pioneer League nomination and ultimately took home the national award for the Rawlings Woman Executive of the Year. Klages Johns and the Osprey Front Office are already hard at work preparing for the 2019 season under the new ownership of Big Sky Professional Baseball L.L.C. and are energized to bring an enhanced fan experience and family friendly atmosphere that Missoula has grown to expect out of the Osprey. Season tickets for the 2019 season are on sale now at the MSO Hub. For more information and a complete schedule, contact the Osprey at (406) 543-3300, stop by the MSO Hub at 140 N. Higgins or visit the Osprey online at MissoulaOsprey.com.